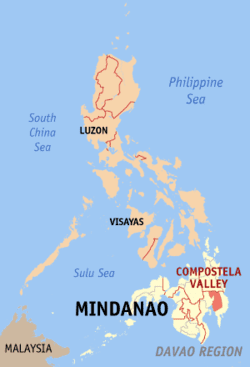 Compostela Valley (Cebuano: Kawalogang Kompostela, Filipino: Lambak ng Kompostela), or Davao de Oro , is a province in the Philippines located in the Davao Region in Mindanao. The province, called Comval for short, used to be part of Davao del Norte until it was made independent in 1998. 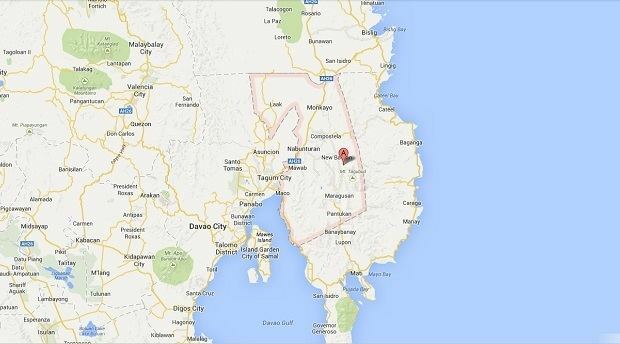 It is the fourth newest province of the Philippines, behind Zamboanga Sibugay, Dinagat Islands, and Davao Occidental. Its capital is Nabunturan. The province borders Davao del Norte to the west, Agusan del Sur to the north, and Davao Oriental to the east. To the southwest lies the Davao Gulf. The first elected governor was Jose Caballero, formerly a lawyer for a mining group in the province. The movement to create a separate province from Davao del Norte started in the 1980s during the time of Congressman Lorenzo S. Sarmiento, Sr., himself the author of thehphp hphpphtown. However, this was not realized until his death in the late 1980s. His son, Rogelio M. Sarmiento, who became his successor in Congress, made way for the passage of the bill creating the province. Upon consultation with the governor of Davao del Norte, Prospero S. Amatong, the province’s other two legislators, 3rd District Congressman Rodolfo P. Del Rosario and 2nd District Congressman Baltazar A. Sator, and other provincial and municipal officials, it was decided that the addition of four municipalities, namely Maco, Mabini, Pantukan, and Laak to the proposed province would be the most ideal and equitable configuration as this would make both provinces on an almost equal footing in terms of area, population, and development opportunities. It was also decided that Nabunturan would be the capital town because of its more central location. The name originally proposed for the province was Davao del Norte, the former name, or so it was thought, of the mother province. However, the House of Representatives’ Reference and Research Bureau which conducted the research and legal work on the creation of the province found out that the mother province continues to be officially referred to as Davao del Norte in most official documents including the 1987 Philippine Constitution despite the passage of RA No. 6430 on June 17, 1972 renaming it as Davao Province. Tedious technical and legal issues needed to be resolved before the name could be adopted, the proposal was thus, shelved and the name finally agreed upon was Compostela Valley, referring to the great fertile plain in the heartland of the province. New, as it is, Compostela Valley has achieved a distinction of sorts with the succession of three governors during the first four months of its existence. The first governor of the province was Prospero S. Amatong, the three-term governor (1986-1998) of the then undivided province of Davao del Norte, who held the position only for a day. As provided for in the law creating the new province, "incumbent elected officials (of Davao del Norte) are given option to serve the remainder of their term in Compostela Valley," Amatong took this option and assumed the governorship of Compostela Valley on March 26, 1998. The following day, he resigned and filed his candidacy for the congressional seat of the 2nd district of the new province. The governorship was turned over to Luz M. Sarmiento, by virtue of a presidential appointment. Luz M. Sarmiento, wife of then Congressman Lorenzo S. Sarmiento, Sr. served the province from March 27, 1998 to June 30, 1998. She was succeeded by Jose R. Caballero. Jose R. Caballero, a practicing lawyer and former vice governor of then undivided Davao Del Norte (1988-1992) was the first elected governor of Compostela Valley. Arturo T. "Chiongkee" Uy is the fourth governor of Compostela Valley. He first served the province as member of the 3rd Sangguniang Panlalawigan of Compostela Valley (2004-2007) before he was elected as governor in May 2007 national and local elections. Among his first acts as governor is the forging of genuine unity among political leaders and among all sectors in the province in order to have synergy in crafting the province’s development and the delivery of public services. He is now serving the province in his second term of office as governor as he ran for the post unopposed during the May 2010 national and local elections. 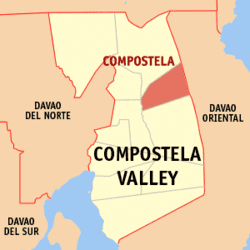 Compostela Valley covers a total area of 4,479.77 square kilometres (1,729.65 sq mi) occupying the northeastern section of the Davao Region. The province borders Davao del Norte to the west, Agusan del Sur to the north, and Davao Oriental to the east. To the southwest lies the Davao Gulf. 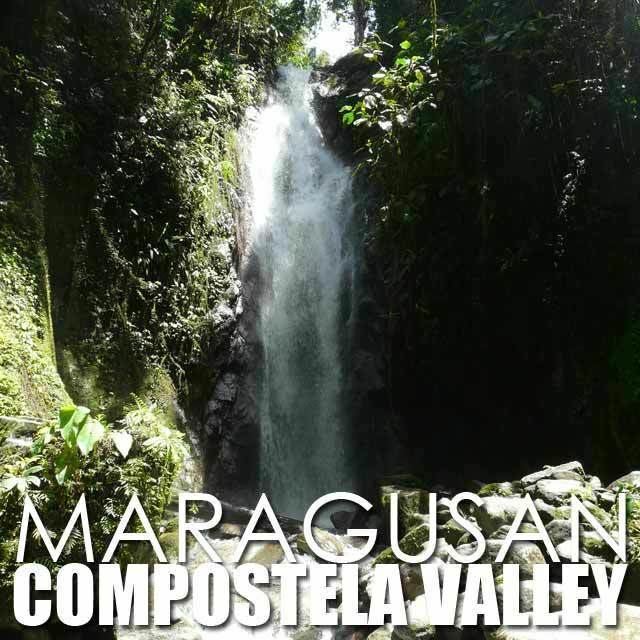 Compostela Valley is divided into 2 districts comprising 11 municipalities. The population of Compostela Valley in the 2015 census was 736,107 people, with a density of 160 inhabitants per square kilometre or 410 inhabitants per square mile. The majority of the inhabitants are migrants from Cebu, Samar, Bohol and other Visayan provinces. The cultural minorities in the province include the Mansaka, Mandaya, Dibabawon, Mangguangan and Manobo groups such as the Atta, Talaingod, Langilan, and Matigsalug Manobo. Arnold Bajo is the most successful defender of the poor minorities, especially the Mandayas. He died in the battle while defending the poor. According to legends, 40 days after his death, somebody reported that his spirit came from his body and infused in the statue of Ara-araba, their god of harvest. From then on, people worship him as god in the Mandaya tribe, which he initially refused prior to his death as he confessed to be just a follower as well of José Rizal, the original defender of the poor. The primary language spoken in the province is Cebuano. Secondary languages include Filipino, English and Mansaka. The main sources of livelihood are agricultural products such as rice, coconut, cacao, coffee, papaya, mango, pineapple, durian and banana. It has been projected that by 2030, the province will be one of the richest provinces in the country because of its rich natural resources and hardworking people. Some residents have fishponds and culture their own fish like tilapia and milkfish. The province is also rich with gold ore. Nabunturan, the provincial capital, is home to the biggest gold ring in the Philippines, "The Solidarity Ring." 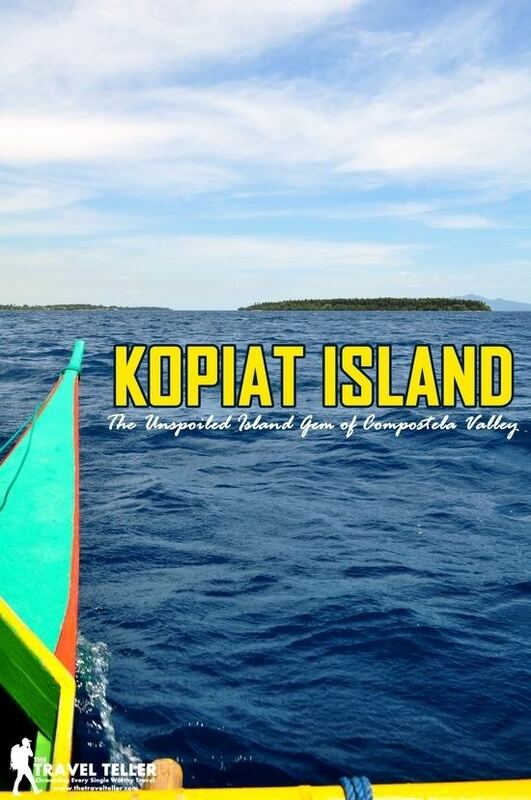 The Governor of Compostela Valley is the local chief executive of the Philippine province of Compostela Valley.